Subscribe Today and Receive 30 Days Free! Welcome. If you’ve landed on this page, you have been offered a special 30 days free subscription to the Las Vegas Sports Insider baseball handicapping service. That’s a savings of $199.95. We offer this discount to you as an enticement to try our handicapping service… Just our way of letting you “kick the tires” while giving you a chance to build your bankroll at the same time! By taking advantage of our offer, our service will virtually pay for itself. So join us today and take advantage of our offer. To accept our offer and subscribe to the Las Vegas Sports Insider service please click on the “Subscribe” button below. 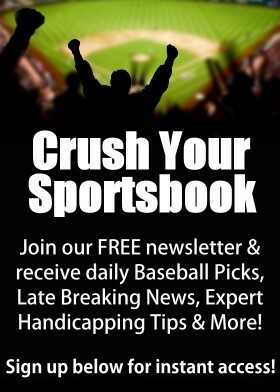 Your monthly subscription includes every baseball pick that we make for the entire 2012 MLB season. Season play begins in April and continues through October.Your handicapping selections will be released before 9:00 PST and emailed directly to you each day. If you’re unhappy with our service for any reason, you are free to cancel your subscription at any time. We’ll be sorry to see you go. Any information from our users or clients is held in the strictest confidence. We will never sell, trade or divulge your personal information.